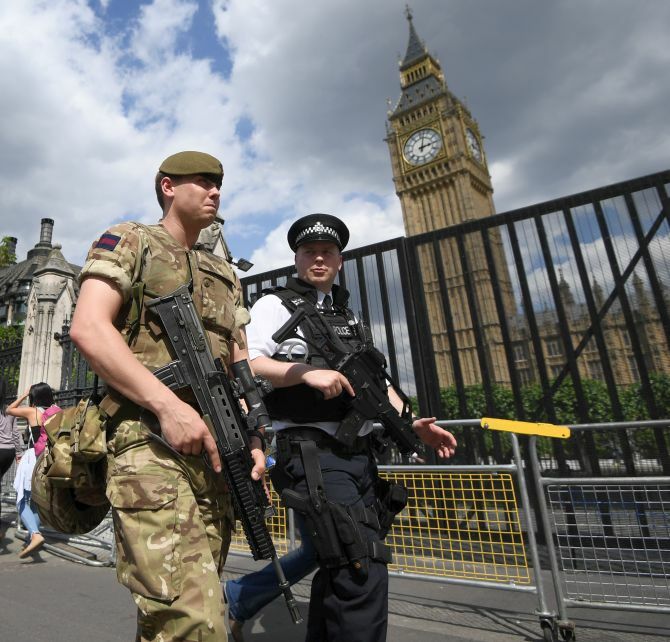 A man with a knife was arrested on Friday by Scotland Yard’s armed officers near the gates of the United Kingdom Parliament amid heightened security fears in the capital following the horrific terror attack earlier this month. The Metropolitan Police said the man -- in his 30s -- was arrested for possession of a knife and there were no reports of any injuries. “Man arrested near Palace of Westminster re possession of a knife. No reported injuries,” the Met Police said in a statement on Twitter. Witnesses reported hearing “knife, knife, knife” as armed officers swooped on the suspect, who looked in his 30s. The man, wearing a grey hooded top, ran towards the St Stephen’s entrance of the Houses of Parliament, which is the main visitor’s entrance to the building. It is feared it may have been an attempted copy-cat terror attack from March, when Khalid Masood rammed a car into the side of the Palace of Westminster, which houses the UK Parliament, killing four people and got out to stab to death a police officer on guard at the House of Commons gates. In April, Mohammed Khalid Omar Ali, a 27-year-old foreign-born British national was arrested on suspicion of carrying knives in a very public operation near Parliament Square as part of an intelligence-led operation. London has been on higher alert since the recent terrorist attack on London Bridge and Borough Market on June 3, which claimed eight lives, and the concert bombing in Manchester in which 22 people were killed.